In my previous article I shown you "Howto split large CSV into multiple pieces?”. 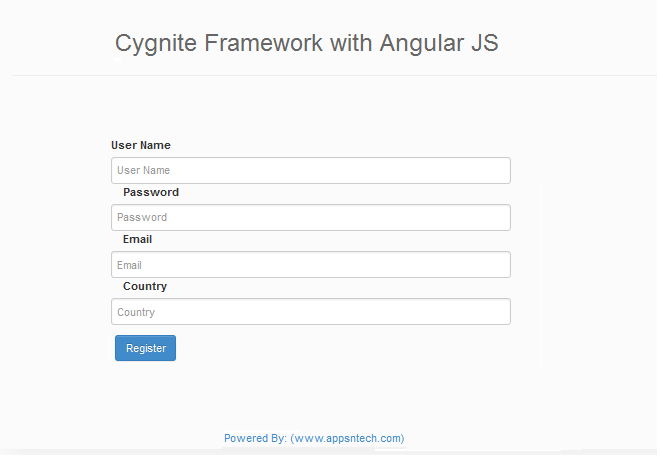 Today I am writing about Angular JS with Cygnite Framework or You can say Angular JS with PHP. Creating a simple app using some Framework will be great instead using core php, since framework does couple of the job for us. While recently checking Angular Js I found it’s features are really awesome. Let me show you how to build registration form and save data into the mysql database. Let us install Cygnite Framework first and set configuration to do so. Simply run below command from your terminal to install Cygnite into your local system. Set up your database connection inside configs/database.php. For more details please follow Cygnite website. You may also use the power of Cygnite Framework Migration System to build table schema, which I prefer mostly. Let us create a Controller to perform all backend operation. I have created AngularController inside Controllers directory and paste below code into it. * Default method for your controller. Render angular registration page to user. Create a Registration model into models directory and paste below code. Create a simple view page for our angular application. Your view page should be inside /views/angular/angular.view.php. That’s all we are done with the Cygnite Framework part. Let us move to frontend with angular js to make our application to work. Let’s have a look at the application structure in assets folder. Let us create a controller called registrationsCtrl.js inside controllers. Controller where we write most of the logic of angular application. You can see our controller has anonymous submitForm function to handle the submit form and bind values to view page. You can see we have created angular controller and also cygnite view page, now let us link everything together with app.js using ng-app and ng-controller. Paste below code into your /assets/js/angular/app.js. That’s it! We are done. Go to your browser http://localhost/cygnite/angular/ and hit enter, you will see the page below. Fill all details on our registration page, information will be saved into database and you will find the below screen. 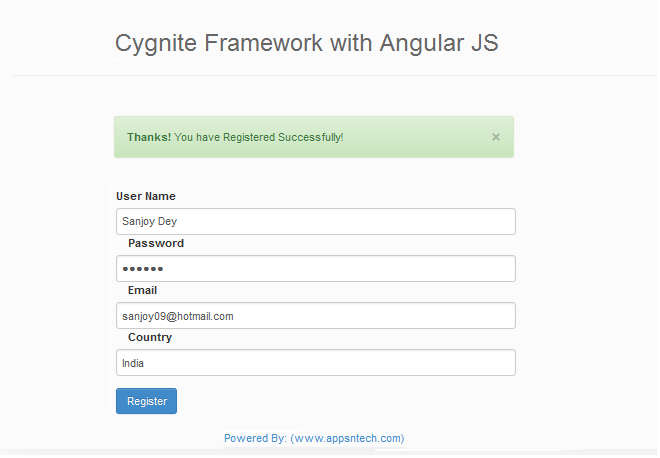 Hope this simple tutorial gives you overview of creating application using Cygnite Framework and Angular js. You also can add much more features to your app (like editing, displaying data into grid etc.). If you find this article please don’t forget to give a small like, give comments, also share with your others. Keep visiting for new posts. How to split Large CSV file into multiple pieces? In my previous article I wrote about “Latest PHP frameworks in 2014?”. Today I am going to share with you another real time experience of mine, which I faced couple of days back. Recently I came across the task where I need to import large csv records into mysql database. It’s quite tough because your phpmyadmin will not allow you to import large file. That csv contains around 10 million records. You may think don't I use mysql LOADINFILE ? Due to some restriction I avoided and choosed my next option as csv spliting. First thing I tried to open that file, but it shows “File not loaded completely”. The reason you get this error because excel can only handle 65,536 lines per sheet and it will not open remaining records. I even tried to import it directly via phpmyadmin but maximum time limit exceeded, then next thing I increased php max execution time but it was taking much time to process that file. So you can solve this problem simply by splitting the large csv file into smaller fragments. By doing that script will consume time limit. 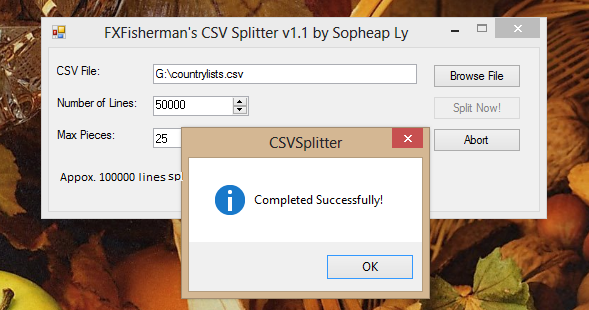 You can simply download FXFisherman’s CSV Spliter program and run the program in your windows system. Installation no longer required. Now you may browse your csv file which you want to split, specify how many numbers of lines you want to have per csv and also another way you can simply specify max number of pieces. Now simply click “Split Now!”. It will start splitting your csv into number of pieces. When process is completed you should see screen like below. Now you can find a folder contains chunks of csv file into it, in the same directory. Thank God! Saved My Day. I was able to import 3 millions of records at the end of the day. Do you have any other better or faster way to accomplish this job? Hope this article is useful, if so please don’t forget to give a small like or share with your friends. Keep visiting for new posts and also if you find my articles are useful you may join us simply following us.